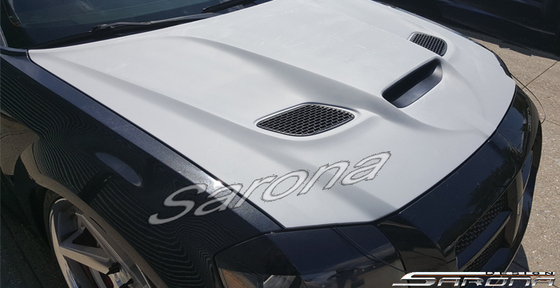 Since its inception in 1990, Sarona Design has been steadily strengthening its position as an aftermarket automotive accessories manufacturer. We have earned a respectable reputation for the quality of our products both here in the United States and in over 20 countries globally where we actively serve auto enthusiast communities. Sarona Design products are proudly made here in the USA. However, we do not stock our products. Each part is made-to-order for the customer that purchases it. We don’t sell OEM products either, and like all other aftermarket companies, our parts require some general bodywork and minor modifications for proper installation. We stand behind every item we produce, and each one has a great fit and finish. We look forward to earning your business! Our mission is to design and manufacture custom body kits, wings, and accessories for a myriad of makes and models in order to help our customers bring their dream car to life. -Professional Installation Recommended. Requires Prep, Prime and Paint - This is NOT a simple bolt on. Note: Sanded, primed or altered parts are non-returnable. All body kits and hoods ship truck freight. Body Kits and Hoods are normally shipped to a business address or freight terminal. These are deliverable to a residential address for additional cost. Upon receiving the item(s) please be sure to inspect the item for "freight damage". If there are signs of freight damage you must refuse the item, then contact us immediately. Once we verify the freight damage with the carrier, a damage report will be filed, and a replacement item will be requested to be shipped. This process usually takes about 5-10 business days.